Every Moment Counts is a mental health promotion initiative developed to help all children and youth become mentally healthy in order to succeed in school, at home and in the community. Children go to the cafeteria every school day for lunch and to socialize with friends. Many students look forward to lunchtime, but for some students, lunch in the cafeteria is not a good experience. The Comfortable Cafeteria program aims to help all students enjoy lunchtime more by creating a positive atmosphere which encourages positive mental health in students. Comfortable Cafeteria is a six week long program that helps give lunchroom staff and students the knowledge needed to foster a positive atmosphere in the lunchroom through six weekly themed education days during a six week period of time. The six weekly themes are, kickoff, friendship, conversations, including others, sensory input, and healthy foods. All participants learn about these topics through interactive programs. The program was designed by occupational therapists, however, it is implemented through the collaboration of many individuals including, cafeteria supervisors, parent volunteers, teachers, therapists, schools nurses, school psychologists, school counselors, and many more. Many schools have implemented this program and have seen numerous benefits during the implementation and after. Children came away from the program with more knowledge of acceptance of peers, knowledge on how to build friendships and communicate with others, and how to make healthy eating choices. 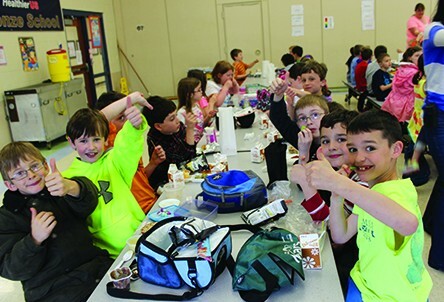 Students felt that the lunchroom was a safer and more enjoyable place to be. When students feel safe at school and included by their peers, they are better ready to learn in the classroom!